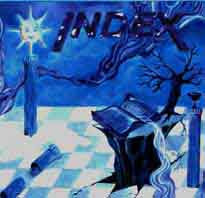 The INDEX band, founded by guitarist Jones Júnior (ex-Quaterna Réquiem), blends Classic Symphonic Prog with some south american music influences and nice accoustic passages. Vintage keyboards bring a classic prog feel to the music. Their (debut?) album is purely instrumental, blending different styles of '70 prog like CAMEL and ELP. For fans of instrumental jazz-prog! "Liber Secundus", the second album, is typically classical style of progressive rock with various references made to the founder bands of this genre such as YES, GENESIS and RENAISSANCE. Interesting combination overall.